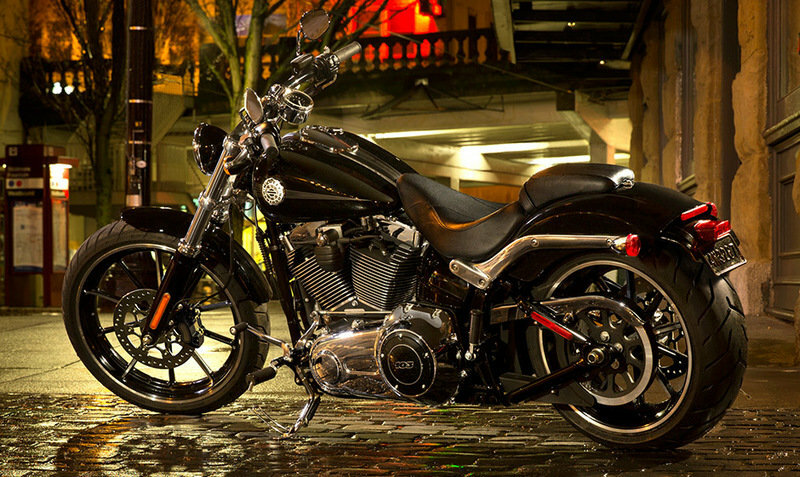 The 2014 Harley Davidson Softail Breakout is here. The motorcycle has all it needs to continue to be considered one of the best looking models in its class and comes with a low muscular profile, modern color options and lots of chrome. 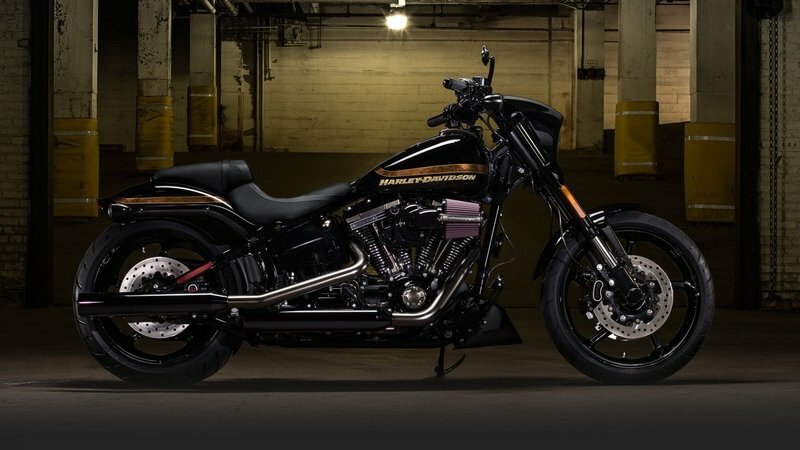 Starting with the chopped fenders and finishing with the riser mounted speedo, the 2014 Harley Davidson Softail Breakout inspires power and respect. Every detail was designed with maximum attention by the company’s designers and we especially like the classy fuel tank, the slammed console and the imposing Gasser wheels. The motorcycle’s center piece is the shiny twin cam 103 engine which boldly displays chrome accents to match the rest of the body. As far as power is concerned, the engine cranks out a peak torque of 95.2 ft-lb at 3,000 which is transferred to the rear wheel through a six speeds Cruise Drive transmission. 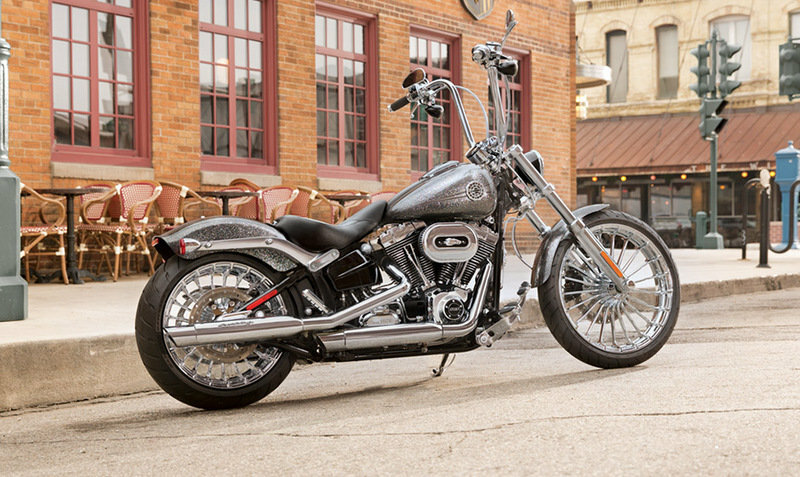 The 2014 Harley Davidson Softail Breakout is offered with a base price of $18.499. 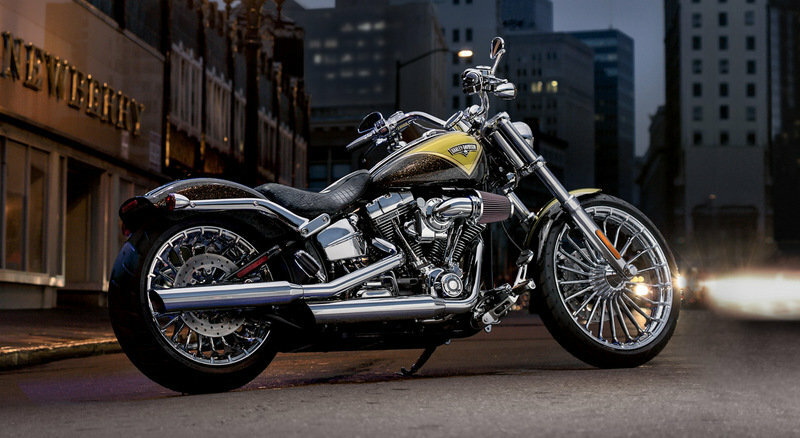 Hit the jump for more information on the 2014 Harley Davidson Softail Breakout (USA Version). 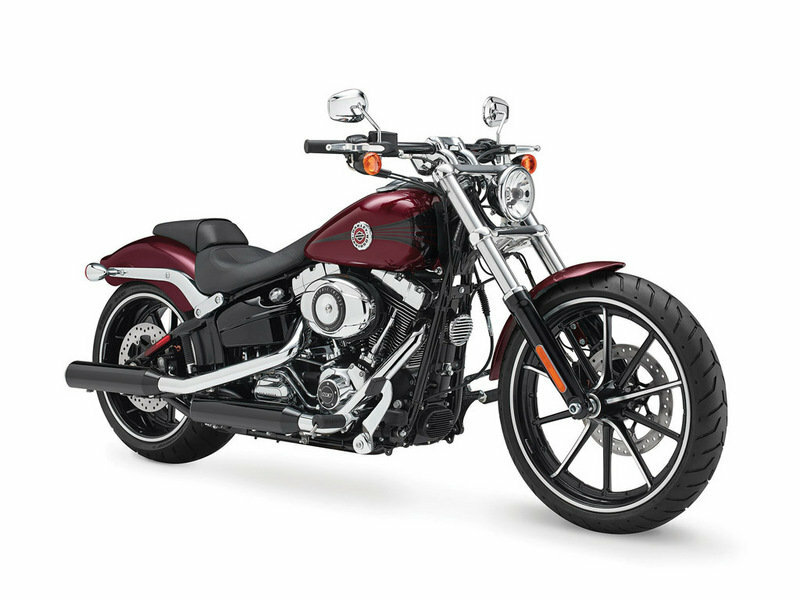 Once again, Harley-Davidson takes what’s old and makes it new again with its revamped-in-2018 Softail lineup, and the drag-tastic “Breakout” is one of the models that made the jump and carried into 2019. Harley offers this bobber-burner with the 109 pound-foot, Milwaukee-Eight 107 and the Mil-8 114 that boasts a total of 119 pounds o’ twist. The ground-up Softail-family rebuild contains myriad changes from the remarkable to the mundane that go way beyond a handful of re-arranged trim packages. We’re talking about the re-invention of the whole range with capabilities meant to offset the loss of the Dyna family, and technology that is more in line with the current industry standards. We’re talking a renewed focus on the Softails as H-D’s sole (or should it be soul?) cruisers. This is it; the drag-tastic sub-model of the range that Harley hopes will attract the younger buyers. Continue reading for my review of the Harley-Davidson Breakout. 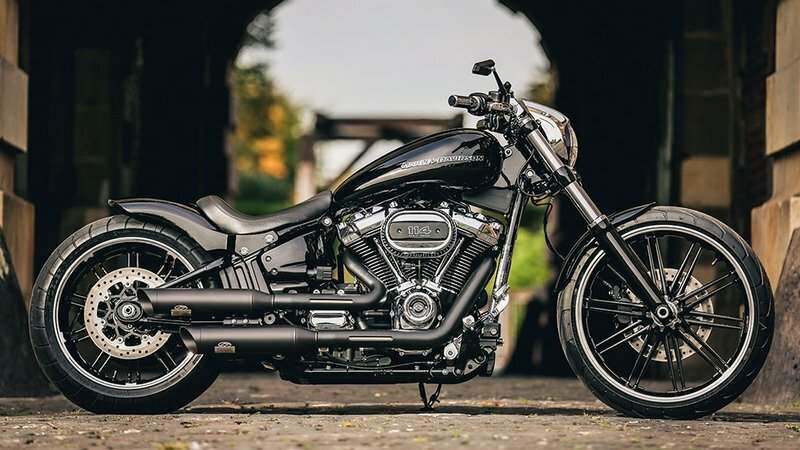 Thunderbike Customs of Hamminkeln, Germany, has long been a favorite among the European artists whose medium of choice is American iron, so imagine my delight when I discovered that it has released a brand-new model based on Harley-Davidson’s revamped Softail platform. Not just any Softail either, but the drag-tastic Breakout no less. My previous favorite was the “Fresh Out,” a kind of trippy paisley cruiser that was also built on the Breakout, but I’ve only just glanced at the newest effort and already I see some really cool stuff. Is it enough to win me over? That remains to be seen, so let’s dive right in and check out what those crazy Germans have been cooking up over there. Continue reading for more on the Thunderbike custom Breakout. Harley-Davidson’s Custom Vehicle Operations (CVO) program has been hard at work churning out models with the toppest-of-the-shelfestfeatures they can cook up. All that R&D isn’t wasted on the premium models though, as frequently technology pioneered in the CVO program makes its way through the Rushmore bikes and on down the line to the less-expensive models. 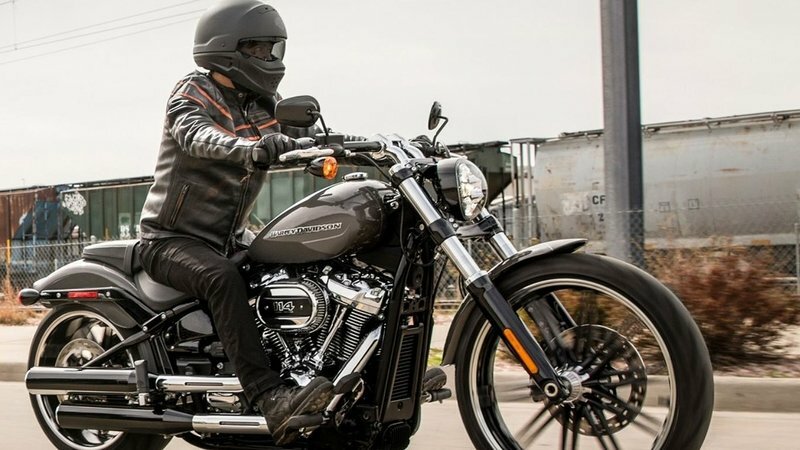 H-D’s newest CVO release is a direct assault on the American muscle-bike market, and it cuts a mean figure with its raked front end and massive V-Twin engine. Introducing the FXSE CVO Pro Street Breakout, a model packed with CVO and Screamin’ Eagle yummy goodness as it rolls off the floor ready for stoplight-burner action. While Harley markets the V-Rod as its “performance line,” this Breakout definitely qualifies for that category as well, albeit with a more traditional look and DNA that goes back to the classic dragster/gasser era. Join me while I take a gander at this latest creation out of Harley’s CVO division. Continue reading for my review of the Harley-Davidson CVO Pro Street Breakout. Harley-Davidson has a reputation for incorporating modern technology with classic design elements from the past, even embracing custom looks that never saw a showroom floor, and the Softail Breakout does not disappoint. The engineers borrowed from the custom “Gasser” look of the 1950s and 1960s when setting up this sled, then they packed it full of CVO-inspired innovations to ensure that the performance is up to date. Back in the day, Gassers were customized drag bikes and this bike pays tribute to its roots while maintaining the performance standards demanded by its customer base. Rigid-looking frames are nothing new, and many manufacturers have followed Harley-Davidson into this cruiser/dragster sub-genre. Kawasaki is one such competitor, and its entry for the 2015 model year is the Vulcan 900 Custom. Since it so closely resembles the H-D Softail Breakout, I wanted to see how these two stacked up against each other. Let’s take a look, shall we? Continue reading for my comparison of the Softail Breakout versus the Vulcan 900 Custom. The Harley Davidson FXSBSE CVO Breakout is one of the purest representations of a classic American motorcycle. The bike features a low, long and slammed profile which is combined with a comfortable saddle and attractive graphics. The 2013 Harley Davidson FXSBSE CVO Breakout is propelled by a capable Twin Cam 110B Engine with 110 cubic inches of power, with a low cruising RPM for comfort and massive torque for performance. This air cooled unit delivers 150 Nm of torque available at its peak at 3,250 rpm. The bike is not only strong, but is also pretty efficient, its combined fuel consumption being rated at 4.5 l/100 km. The engine is combined with a six-speed Cruise Drive transmission which provides smooth, quiet shifting and reduces engine speed on the highway offering a perfect match between engine RPM and road speed. Hit the jump for more information on the 2013 Harley Davidson FXSBSE CVO Breakout.